When you talk about Netherlands scene, you must keep in mind that those lands gave to the world names as PESTILENCE, ASPHYX, SINISTER, GOREFEST and GOD DETHRONED, bands that honor the style with their strong and brutal works. 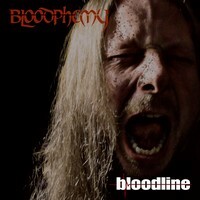 But newcomers are welcome in the circle of brutality, and we must welcome BLOODPHEMY, a quintet from Amersfoort, that after long 17 years since its beginning, and that now comes with their first full-length, called “Bloodline”. Playing an old form of Death Metal that remembers the first half of the 90s, and following the Dutch Death Metal sound, they are doing a very good work: aggressive, nasty, brutal and aggressive. But they have a strong personality, the same thing that I keep saying that many bands forget when creating music. They are a traditional Death Metal band, but they do things on their own. The sound quality of “Bloodline” is truly good and interesting: they are an Old School Death Metal band, but they use a modern insight to breed a sound quality that can be violent and raw as their musical work needs, but with a clean aesthetics, and this feature is what makes their music become a monster of brutality that will smash our ears and brains! Nine very good songs are awaiting the Death Metal fans, but the brutal charm of “Void” and its nasty and catchy guitars, the raw aggressiveness on the fast tempos of “Blood Will Tell” (that shows excellent work from bass guitar and drums), the bitter and slow rhythm of “Sides”, the traditional high adrenaline of “Infanity” with its nasty guttural grunts, the monstrous “Soulmate” with its nasty riffs, and the massive strike of aggressiveness of “Annihilation” can be said as their best moments. Brutal and catchy, “Bloodine” is a very good first album, and we hope that they will not take so long to come with another bloody Death Metal puke like this!